You did the smart thing by looking around/waiting for a sale. We did the same thing when we bought our fridge for our house (the previous owners took their old, very outdated and very small fridge with them for some reason). Best Buy cycles through sales on appliances about every 6 to 8 weeks, so we waited for the fridge we had picked out to go on sale before we purchased. We ended up living without a fridge for about two weeks, but we made it work and it was worth it to get an awesome deal! Knowing the cycles that stores go through is key. Though I don’t think I could live without a fridge for two weeks! When it comes to buying appliances that will most likely last close to a decade, you have to do a bunch of research. We bought a fridge a couple of years ago and really had to put thought into the size, style, and color. We opted for black since Mr. LH is really particular about cleanliness and he thought the stainless steel would show fingerprints too easily. Luckily, it matched all our other appliances. But from here on out (or at least the next 7-10 years) our appliances will need to be black! I sure don’t want to be doing this in another 7 years, so let’s hope it lasts longer. Sad that that’s all we can expect these days. When we first bought out house we had to replace everything except for the fridge. We shopped around a lot but my husband installed everything and we had a truck at the time so that saved a lot of money. We are looking into a new fridge now too. Not sure if we are going to get one just yet but would be nice to get a one within the next year. I’d be fine with any of the other appliances except the dishwasher. We’ll see how things play out over time in terms of the rest of the appliances. I think the facts that it already leaks and it’s noisier than heck let this issue push us over to go new versus the repair. If it were just one of those things we could probably look a little further into repair, but as it stands we’ve just sort of hit the end of our patience with it. I always hate how appliances always fail at the worst times. It was great you could almost schedule the replacement. I replaced my dishwasher a few years ago right before Thanksgiving. I opted for a Frigidaire stainless model. As I replaced the refrigerator and then dishwasher, I switched to stainless steel. I still need to replace the (gas) stove, but it is still chugging along. I don’t really mind it may look mismatched for now. When I bought the dishwasher, I received a 90 day guarantee regarding lowest price. Within 60 days, a found a lower prices and they refunded $60. That’s a good point. I think Sears has a 14 day price match so if they do happen to come out with something better on Black Friday, I ought to be covered. I’m glad the water didn’t ruin your flooring or something like that! Leaks can be so damaging. I got a six pack of the water sensors and put them in spots that I couldn’t see and/or had a likelihood to leak. It’s caught them in three of six places so I’d guess I chose wisely! I haven’t had to go appliance shopping, but this is very helpful…..as our house (and appliances) are nearing the 10 year mark – which is getting close to the average end of life for some appliances. I’m not exactly looking forward to dropping cash on appliances, but it’s time to start resigning myself to the fact it’s going to happen. I think the fridge is right around 10 years old. The stove is probably original, though I’m not sure. We installed the microwave in 2007, as well as bought the washer and dryer. It completely boggles my mind that those will be considered ‘old’ in less than 4 years. Thankfully we haven’t had to buy an appliances since we bought our condo. The fridge, microwave and stove are just a few years old, so hopefully we won’t have to buy any of those for a long time. We do know the furnace is older, and are crossing our fingers we get a few more years out of it. I know, we had a scare last summer with our outside condensor, and the furnace itself is original so around 15 years old. I’m thinking that or windows will be next in terms of mega-purchases. The thing about the fridge is that the second one would come in handy so it wouldn’t be replacing as much as supplementing. Maybe at some point, but we’ll see. We got a new dishwasher this year too, LOVE it. We scored a great deal after Christmas last year. w00t! Good work on the price! And great luck having the old one keel over shortly before Black Friday. Getting 14 years out of the old one is an accomplishment. Several repair dudes have told me that ALL kitchen and washroom appliances are now engineered to crap out in 7 years. Given how much they cost, that just drives me nuts. 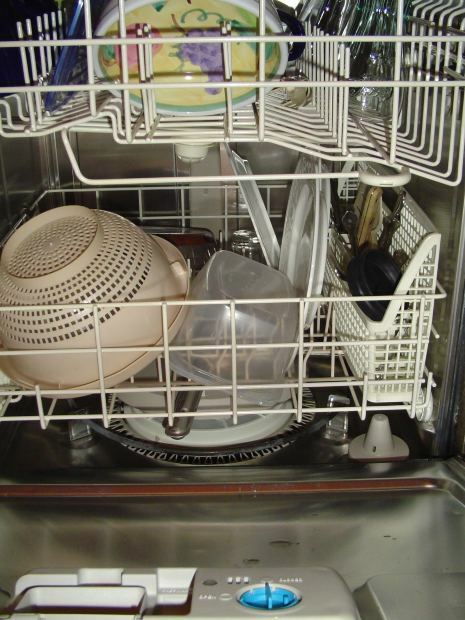 Next time the dishwasher dies, I think, I’m not going to replace it…it’s just not that hard to wash dishes by hand, and having to buy an expensive new appliance every 7 years feels like a grand rip-off to me. As for the oven, the wonderful self-cleaning oven engineered so that you can’t run the self-cleaning cycle without breaking it — I now use the propane grill for roasting as well as grilling. You are gonna be SO AMAZED, though, at how quiet the Bosch is. Sometimes you can’t even tell it’s on! I’m looking forward to the quiet. Ours has always been loud, and the one I had at my condo before this house was loud as well, so I’ve never had a quiet one. One drawback is that I’ve heard that part of how they lower the noise is to make the motor less powerful, so they extend the cycle time.